This entry was posted in Azure on December 25, 2012 by mohamadhalabi. 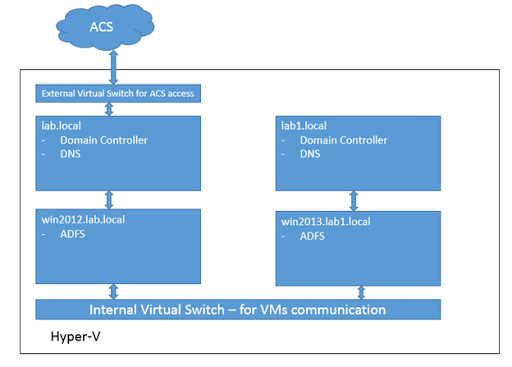 Azure Access Control Service (ACS) plays two roles; it is used to authorize access to the Azure Service Bus and Caching, and it also serves as a Federation Provider (R-STS) for your applications on the cloud. In the context of this article, I am concerned with the second role: how ACS serves as an R-STS. Just as ADFS was your R-STS (or IP-STS depensing on the context) on premise, ACS is your R-STS on the cloud. 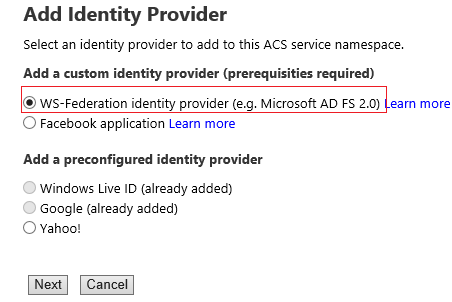 Note that ADFS is itself one kind of providers that can be trusted by ACS; this will be shows in a separate section. 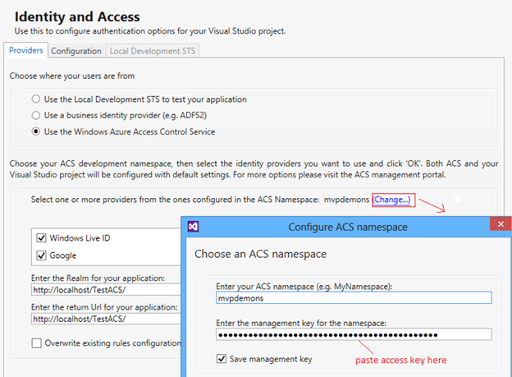 In this example, I will show you how to outsource authentication of your ASP.NET application to ACS. 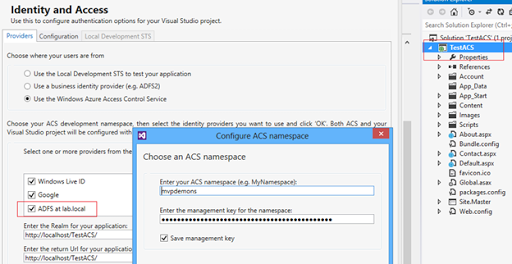 Note: the approach I am following now will automatically configure the RP in ACS. Another approach is to select “Use a business identity provider (e.g. 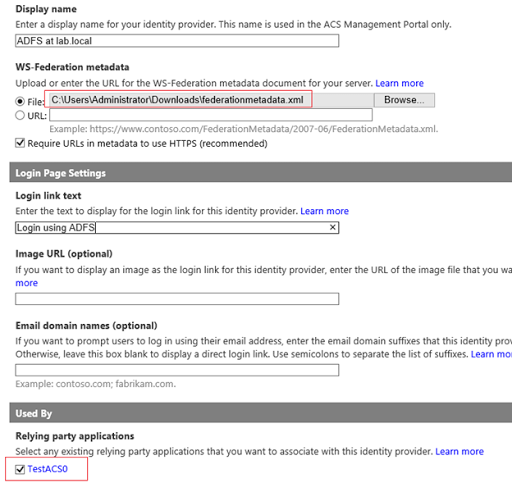 ADFS2)” in which case you will have to get the federation metadata file URL of ACS from the Application Integration option in ACS portal. Once the wizard is completed, the application will be configured as a trusted RP for ACS; as always you can check the updates in web.config and the newly created file \FederationMetadata\2007-06\FederationMetadata.xml. In the ACS portal click Relying party applications and you will see that the RP is automatically configured via the wizard you ran at step3. Note that each provider issue by default a set of claims; of these claims offered by Google are the nameidentifier and name claims, which is how the RP (actually WIF at the RP) managed to identify my name in the welcome message. In this section, we’ll use ADFS as an IP for ACS. Since ADFS is installed on my local network, ACS cannot extract ADFS metadata via a URL so we need to give ACS the metadata file in order to set up WS-Federation. Open https://win2012.lab.local/FederationMetadata/2007-06/FederationMetadata.xml in the browser, and save the result XML in a file. 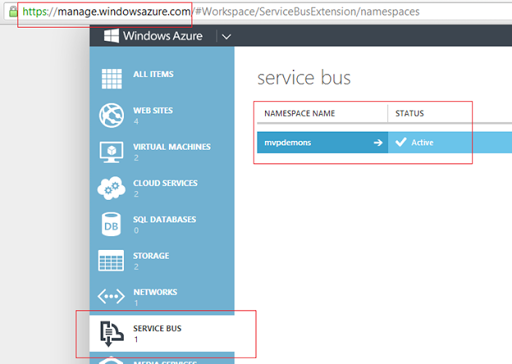 We will continue using the same service bus namespace we used before. So again navigate to https://mvpdemons.accesscontrol.windows.net/v2/mgmt/web. 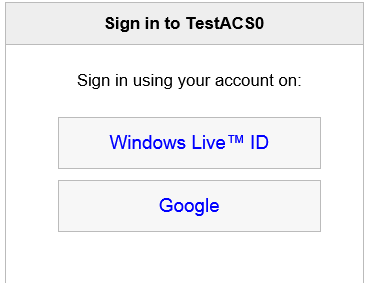 Note that we will use the same TestACS application we used in section “ASP.NET and ADFS”. As you should know by now, ADFS is an IP for ACS, which makes ACS an RP for ADFS (if that did not make sense, then I failed horribly in this non-ending publication :)). Recall that ACS uses Rule Groups to set how claims are passed over to relying applications (ASP.NET application), so we need to configure Rule Groups to handle the new claims to be sent from the new IP (ADFS) the same way we did to handle claims from Live ID and Google. Now do not get scared! 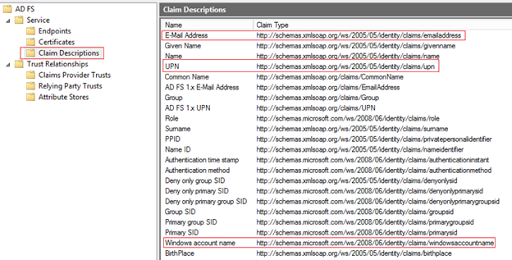 I know that when we configured Claim Rules in ADFS we only configured Email Address and UPN, so what are all these claims? These are all the claims configured for ADFS, but not necessarily all what ACS will get from ADFS. We have told ADFS to pass Email and UPN (the above claims list is a grid with paging, UPN is on another page), and that is what ACS will get. Can you see our good old “birthplace” claim? This is the claim we configured long time ago using a SQL Attribute Store, see how it appears here; it’s all adding up, isn’t it? Finally we’re ready to re-run TestACS on localhost and see how the ADFS has been added as an authentication option via ACS. After you login, you will be redirected back to localhost as a logged in user. This entry was posted in ADFS, Azure, WIF on December 17, 2012 by mohamadhalabi. If any of these topics is new to you or you need a refresher about, then please go ahead and read the above mentioned article before going on. …So you read the article and your back! This means that you know that ADFS can play the role of an IP-STS and R-STS. This article discusses ADFS in the context of both roles. I used makecert.exe to create CAs and self-signed certificates on each ADFS box. Each ADFS instance trusts the public key of the CA of the other ADFS. In this scenario, consider an organization – represented by the lab.local domain – which wants to outsource its authentication logic to an IP-STS played by ADFS 2.0. The client applications are equipped with WIF to handle WS-Federation protocol. What this has done is transforming the application to an RP; which you can see by checking the web.config file of the RP as well as the newly created FederationMetadata.xml file under FederationMetadata\2007-06. And that’s it! You have outsourced authentication from the RP to ADFS which will generate security tokens containing claims for your RP. You will be redirected to ADFS to authenticate and will be prompted by the default windows authentication pop-up window (more about ADFS authentication later). Supply the domain username/password and you will authenticated by ADFS and redirected back to the RP with the configured claims (claims engine in ADFS will be discussed later). ADFS generates the token containing the claims, signed with the ADFS signing certificate. The RP verifies the token signature as well its conformance to the policy in the Federation Metadata and grants access. Now say you have another application that you want your same set of users to access. So you decided to also convert it to an RP and outsource authentication to the same ADFS. How can SSO between the first and second application be achieved in this case? The answer is that SSO is already in place and you have nothing to do! The magic is step4 in the walkthrough above. When an RP sends a session cookie to authenticate a specific user for the first application, the same cookie is then sent to the other application when the specific user browses to it; this is the browser default behavior since a cookie is scope for a domain rather than a specific application. WIF SessionAuthenticationModule in the second application identifies the cookie and the user is granted SSO. To test this, simply create another web application in the lab.local domain and go through the same procedure described before to convert it into an RP which trusts ADFS. Now authenticate using a certain domain user in the first application, change the browser URL to point to the other application and you will see SSO in action. You can change the authentication option by locating the web.config of adfs\ls\ virtual directory in ADFS server. Change the order of the localAuthenticationTypes element and position the option you want as the first element. Client certificate authentication: this option is usually used in specific cases where you want to guarantee that specific devices get to access the RP. In this case, a client certificate is issued specifically to a certain device, this certificate in turn gets mapped to a specific user in AD. The certificate gets appended with the sign in request and once verified, gets mapped to that specific user. The fact that ADFS supports only AD as an account store can be seen as a drawback which will actually limit ADFS adoption. However, ADFS can be configured to trust another STS (for example sitting in front of an Oracle account store) so ADFS can transform claims issued by this STS into the ones needed by the RP that trusts this ADFS. Some will argue that there is no need for this hustle since I can make the RP trust the claims issued by the STS directly; and this is a valid argument. However, the value of this capability becomes apparent in scenario where you want to federate two different infrastructures, one using ADFS and another using a non-ADFS STS. Attribute stores hold the profile information for users. This information is then packaged into claims for the RP to make authorization decisions. 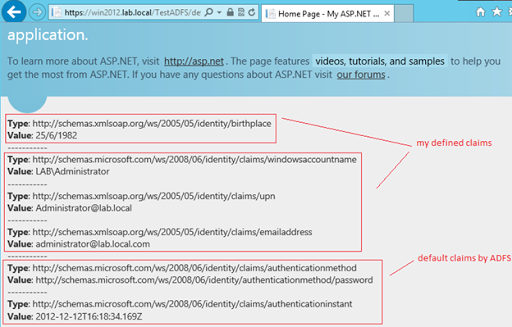 For example, a user authenticated against AD might have his birth date stored in SQL Server. The birth date gest extracted from SQL and packaged as a claim to be sent to the RP. Attribute stores are the topic of a coming section. 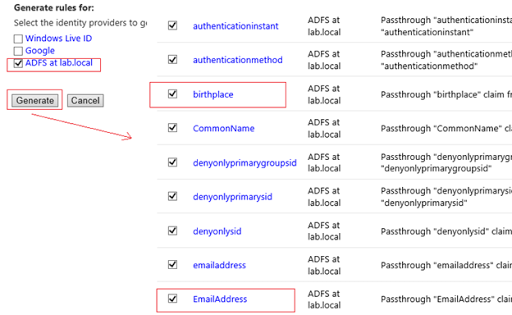 The default forms authentication page offered by ADFS might need to be customized for specific organization needs. One common and trivial requirement is to apply the organization’s look and feel on the page through a master page or adding the company logo. To perform these changes, locate page FormsSignIn.aspx in adfs\ls virtual directory and edit the markup. In order to add the required logic to validate the OTP, you can similarly edit FormsSignIn.aspx.cs and edit event handler SubmitButton_Click to perhaps add your own custom logic prior to calling the SignIn method which actually does the authentication against AD. 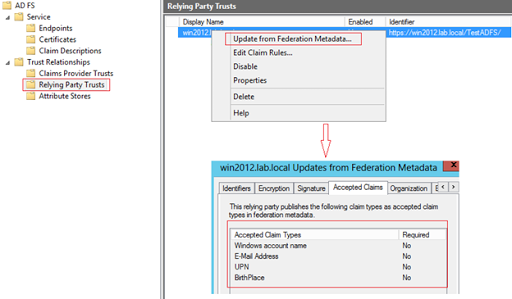 In the previous section we have ‘settled’ with the default claims offered by ADFS 2.0 and WIF Identity and Access wizard at the RP side. 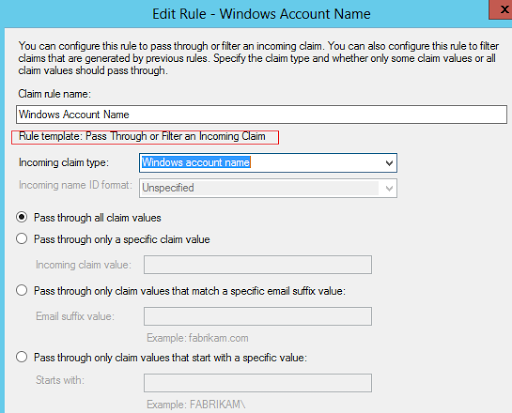 In this this section we will look more into claims and then use SQL Server as an attribute store to issue profile data as claims. 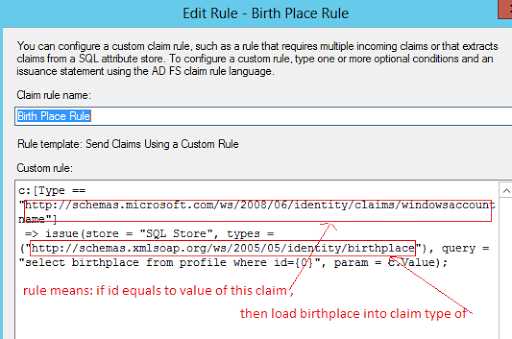 Note that the last claim type – birthplace – is not a default claim type in ADFS. This is a claim to be extracted from SQL Server attribute store as we will see later. Forget the “Birth Place Rule” for a moment as it will be discussed with the attribute store. You will notice in the above image that Active Directory is itself an attribute store in addition to being (the only) account store. So why do we need additional attribute stores you may ask? Simply because it’s very rare to find an organization that stores profile data about users in its AD. Profile data is frequently updated and the schema is often changed clearly making AD not a suitable habitat for it. As discussed previously, ADFS can establish a trust with another STS which might talk to another type of account stores; however, by itself ADFS is limited to AD as an account store. Attribute stores allow storing profile information about accounts which can then be sent as claims. The Id column holds the value extracted from the account store, the idea is that the account store will give the identity while the profile will be loaded from the account store. Take a look again at the first diagram of step3, there you will see the BirthPlace claim type defined. This is a custom claim that has to be created explicitly. By now you know (if you read my WIF article) that ADFS can be either as IP-STS as in the previous section where it sits in front of AD and takes care of authentication RPs inside the same organization. 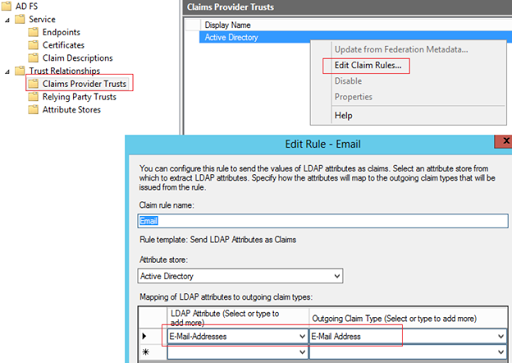 Or it can be in an Acocunt Partner – Resource Partner relationship (to be discussed next) where the ADFS in the Resource Partner role handles claims coming from the Account Partner. In the next walkthrough I will show you the three rules gets executed in order. By default any ADFS installation will have Active Directory as a Claims Provider Trust. This simply means that ADFS in an IP-STS role; which is again what I showed you in the previous example. 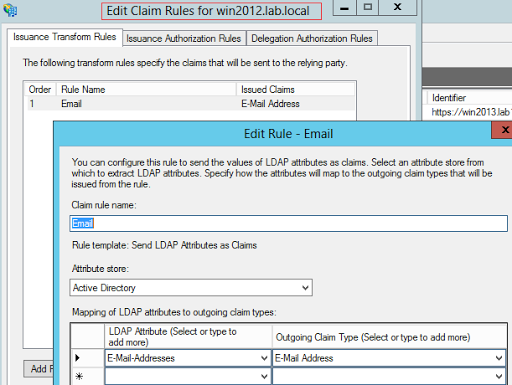 Now you can see that “Acceptance Transform Rules” are the rules that get executed when ADFS first gets the set of claims. In this case, all rules are pass through from AD into the next level. 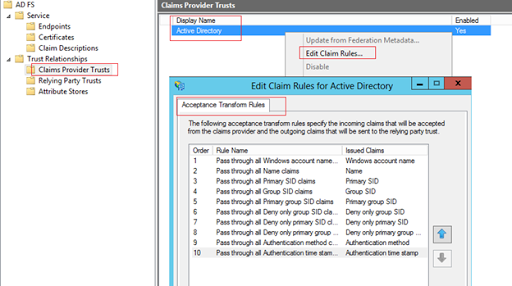 Similarly here you can see that you can define your own Acceptance Transform Rule; only in this case these rules will be applied on claims incoming from the upstream ADFS instead of those coming from AD as an account store. Whether in IP-STS or R-STS role, the next step in the pipeline is applying whatever authorization rules defined at the Relying Party trust level. Any deny claim in this stage will prevent claims from being issued. As you can see, these are the rules that I have showed you in the previous section including the custom rule of the SQL attribute store. Account Partner (AP): an organization playing the AP role is the one whose users want to access secure resources (relying parties) by the other organization. The AP exposes an IP-STS (ADFS) which users authenticate against. The security tokens generated by this STS are trusted by the other organization’s R-STS (ADFS). These tokens contain claims coming from AD account store and optionally an attribute store. Resource Partner (RP): the organization in the scenario above plays the role of the RP. An R-STS (ADFS) hosted by the RP trusts the tokens issued by the IP STS and then issues its own tokens that are trusted by the relying parties that will be accessed by the AP users. Needless to say, in any trust relationship each organization can play both roles together; meaning it can be an AP whose users want to access the relying party application and it can itself be an RP hosting a set of relying parties to be accessed by users of the other organization. 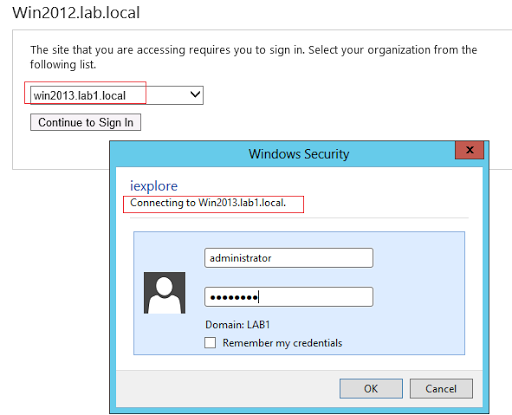 Lab1.local users wish to access a relying party (RP) in lab.local. Both domains establish federated trust where user authenticate against AD in lab1.local and get security tokens issued to lab.local. Since trust is in place, lab.local verifies the claims (and can perform whatever transformations it wants) and then hands them to the RP which grants access. In this sample, I will configure a LDAP pass though rule to send email tokens from the account partner to the resource partner. 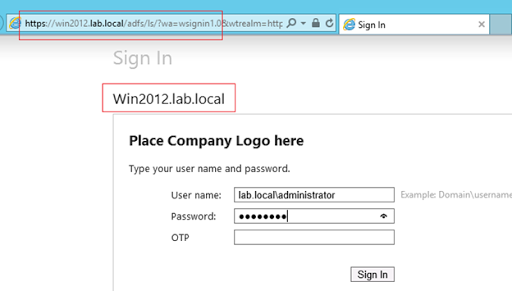 Here we configure ADFS at the resource partner domain (lab.local) to be a trusted relaying party at the account partner domain (lab1.local). Note here that instead of trusting a single relying party application, we are trusting the entire domain (review the section about R-STS in my WIF article if this is not clear to you). 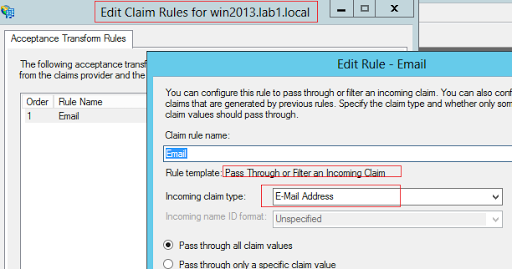 And then we create a claim rule to allow passing the email claim of which its rule was created in step1. 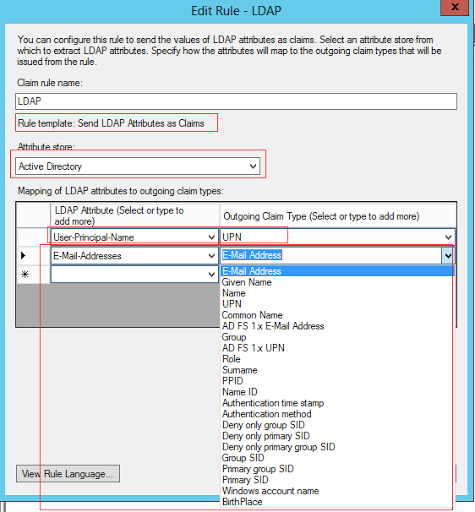 Here we add ADFS at the account partner domain as a trusted claims issuer at the resource partner domain, so that user at the account partner domain can access applications at the resource partner. We finally add a pass through rule to allow the email claim incoming from the account partner to be passed to the relying party application (recall that the relying party application – called TestADFS in our first demo – is already in a trust relationship with ADFS in its own domain; i.e. the resource partner domain in this example). Step4: Let’s run this darn thing! The page the user gets in the browser is the result of Home Realm Discovery, which is the process of WS-Federation protocol knowing which IP the user wants to use to login. 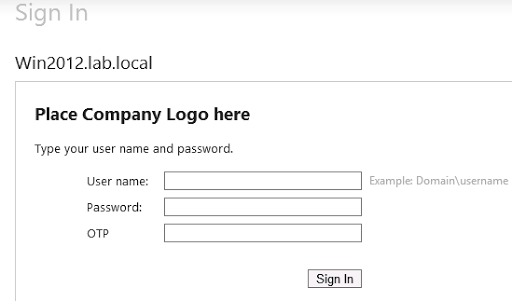 In this case of course the user is an employee of lab1.local domain, so she will select the second option and continue to sign in. 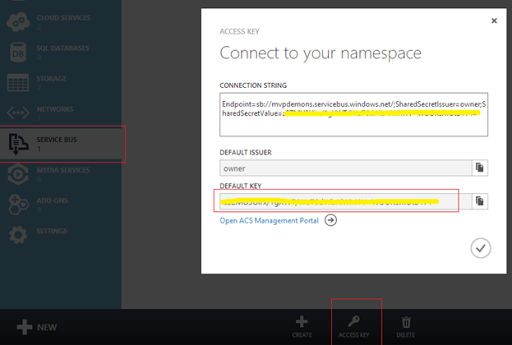 This entry was posted in Azure, WIF on December 6, 2012 by mohamadhalabi. This entry was posted in Azure on June 20, 2011 by mohamadhalabi. I knew something was wrong with the endpoint, from the error message i could tell that most probably the problem was that the endpoint address being used by some other process. As you can see, i had ports 10001 and 10002 saying “cannot obtain ownership information” but anyway I had no problems with these ports as they are associated with the Queue and Table services respectively and both are started. However, it is clear that port 10000 is occupied by BitTorrent on my machine (yes you caught me!) so that is why the Blob service could not be started. Once I stopped BitTorrent I could start the Blob service. 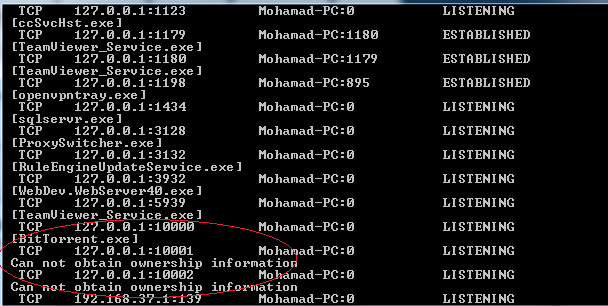 (replace 1.4 with your SDK version) and openning DSService.exe.config. From there you could change the configuration and make your services listen to another ports. This entry was posted in Azure on June 3, 2011 by mohamadhalabi. This entry was posted in Azure, SQL Azure on June 5, 2010 by mohamadhalabi.